Officials from the Tour de Georgia Foundation, Inc. and AT&T Inc. (NYSE: T) unveiled today the new branding for the spring's world-class cycling event, which will become the Tour de Georgia presented by AT&T. As the Presenting Sponsor for 2008 Tour, AT&T will own exclusive rights for "Communications Services" for the event, scheduled for April 21-27. "AT&T is pleased to continue its involvement with the Tour de Georgia this year," said Sylvia E. Anderson, president of AT&T Georgia. "The Tour brings Georgia families together and attracts fans and participants from across the nation and around the world to enjoy the world class cycling event in the context of Georgia's natural beauty. The Tour brings substantial tourism and economic development dollars to our state. On behalf of AT&T, I offer my congratulations to the Tour and to Lt. Governor Casey Cagle for his leadership in making Tour de Georgia not only an economic success for Georgia, but an important philanthropic contribution, as well, by associating this event with the Aflac Cancer Center and Blood Disorders Service of Children's Healthcare of Atlanta." Last year, AT&T signed as one of the Tour's Founding Partner sponsors, which included naming rights to the Overall Leader jersey awarded after each stage. As the Presenting Sponsor in 2008, AT&T will maintain ownership of the AT&T Leader jersey and will receive prominent branding at all venues for race week, in all pre-event promotions and in all sections of the website. The event website, tourdegeorgia.com, was one of the most visited bicycle race sites worldwide in 2007. The entire site has been redeveloped to reflect the AT&T partnership. "The new Tour de Georgia presented by AT&T is going to be special. It is the sixth year for the event and I am confident that AT&T will help us make this year's Tour the biggest and best yet, for spectators and cyclists from all across the state and all around the world," said Lt. Governor Casey Cagle, who serves as the chairman for Tour de Georgia Foundation, a 501 c3 organization that recently took ownership of the sports property. The Tour had previously been operated by the Georgia Partnership for Economic Development (GPED). 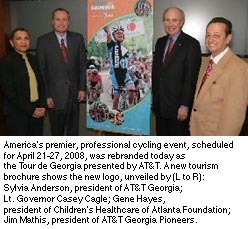 A board of directors oversees the marketing, business operations and strategic partnerships for the Tour de Georgia presented by AT&T. AT&T is encouraging all employees to volunteer at the Tour through the AT&T Pioneers program. Pioneers are people who want to give back to their community, allowing them to utilize their own unique skills and interest to make their community a better place to live and work. This volunteerism is also a way to help the event beneficiary, the Aflac Cancer Center and Blood Disorders Service of Children's. "We are absolutely thrilled to be involved with such a wonderful organization such as the Tour de Georgia," said Shelton Stevens, Senior Development Officer for Children's Healthcare of Atlanta. "We have no doubt that this monumental event will help the Aflac Cancer Center in its mission to find a cure for childhood cancer and blood disorders." The Aflac Cancer Center and Blood Disorders Service of Children's Healthcare of Atlanta is a national leader among childhood cancer, hematology, and blood and marrow transplant programs, serving infants to young adults. Recognized as one of the top five pediatric cancer centers in the country by Child magazine, the Aflac Cancer Center treats more than 325 new cancer patients each year and follows more than 2,000 patients with sickle cell disease, hemophilia and other blood disorders. The Aflac Cancer Center is one of many programs at Children's committed to enhancing the lives of children through excellence in patient care, research and education. Children's, one of the top three pediatric healthcare systems in the country, is a not-for-profit organization that benefits from the generous philanthropic and volunteer support of our community. Visit www.aflaccancercenter.or or call 404-250-KIDS for more information.